Message: ... and The HIVE will obliterate you. I do hope that's clear enough for you. Curiousity was raised by hitting my new planet twice, if you must know the reason. Well yes, I rather assumed that three raids upon your colony would raise some sort of response. I certainly had no issue with the probe... I merely wished to establish clear boundaries as we proceed past this potentially awkward "introductory" stage. For example, your colony is wonderfully close to my home world and very poorly defended. So I am now considering it my farm. I realize this may be horribly inconvenient for you, especially given the astonishing cost of colonization, but I'm afraid that's not a consideration for two reasons. First, it's entirely too crowded in this sector as it is. Any new comers must either bring a substantial fleet to defend their claim or become fodder for the rest of us. By all appearances, you fall under the later heading. Second, we are the HIVE. If you're not with us, you're food. And quite frankly there are very few people with is. And, if memory serves, your league has had "relations" with us in the past. This "dialog" ended poorly for your fellows. So... I hope the boundaries are clear. Mantua (charming name, by the way) is to become a farm for the HIVE. Feel free to develop it as you see fit, but make no mistake... you'll be seeing a great deal of us. We'll see if he caves right away or puts up a struggle. Alas, he has fallen to grim silence. I may need to send a jab at him to rouse him from his despondency and provoke him to hurl his frail fleet against the mighty walls of the HIVE. I only pause to discover how the negotiations with CM are resolved. Diplomacy continues to be the bane of my existence. Aw, don't say that. Diplomacy is necessary in the universe. That's the first reason why I play with Xen. PS: This is my kind of diplomacy. 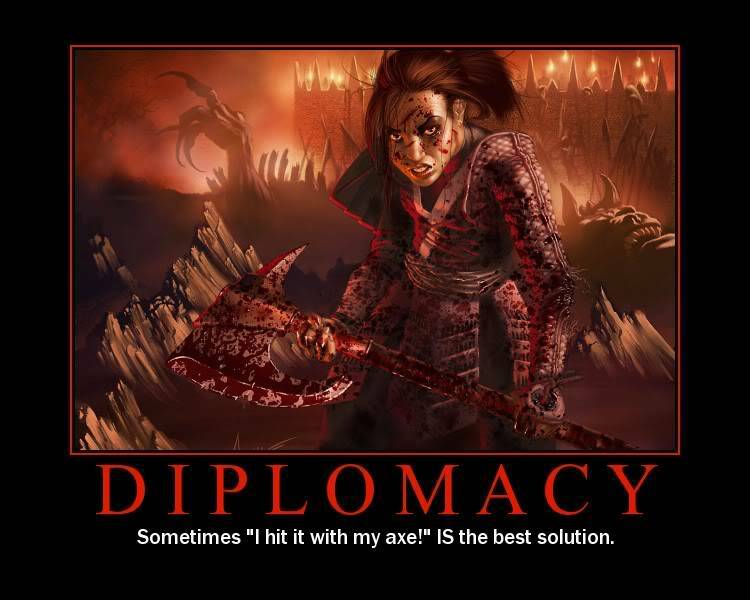 Diplomacy; The art of using the better stick. Ah! THAT Diplomacy! Now THAT I understand. Of course it's THAT diplomacy. Is there any other kind?????? Well, my dear Ignis, there are many things that wear the FACE of diplomacy, and it is prudent to recognize those faces of civility if, for no other reason, than to know how best to offend someone.